Stop the Clocks Watch the tide, not the time. Whatever your age you can stand and stare out to sea like the fishermen of old. Visit the places featured in CBeebies’ “Old Jack’s Boat” which features Bernard Cribbins as ‘Old Jack’, a retired fisherman who lives in Staithes. Wander the Alleys and Ginnels The old village is a maze of little snickets, all with intriguing names. Each alley offers a wonderful variety of views of the village – out to sea, over the harbour, up and down the beck all glimpsed from among a fascinating huddle of cottages. 3 With its higgledy-piggledy cottages and winding streets, Staithes has the air of a place lost in time. Once one of the largest fishing ports on the North East coast, this coastal hamlet is now a well-loved base for exploring Yorkshire’s cliff top paths and discovering the delights of rock pooling and fossil hunting on the small sandy beach. Follow the Painted Illusion Trail Look out for the mind-boggling painted illusions that have been created around the village by world-renowned trompe l’oeil artist Paul Czainski. Is that a seagull perched on the ledge? Clap your hands and if it doesn’t fly away the chances are it’s a painting. See through the Eyes of Artists Home to the impressionist art colony known as the Staithes Group, Staithes has long been a magnet for art and artists, never more so than today. The work of a range of artists making art in an infinite array of media and styles can always be seen in the village. This village’s unique charm, with its huddled cottages, towering cliffs and choppy sea, has long been a powerful draw for those interested in fine art, geology and getting back to nature. Take a Longer Walk Staithes is a walker’s paradise. The Cleveland Way stretches high up onto cliffs and then down to beaches and coves. There are also some splendid inland walks into the hills and valleys of the spectacular North York Moors. The ‘old village’ is located in a small, sheltered cove at the base of the cliff and provides small B&Bs and holiday cottages - the perfect place for a family holidayINGLETON or a long weekend. Beachcombing and Rockpooling The wavecut platform from Staithes all the way MALTON round to the beautiful old, decaying Port Mulgrave is exposed at low tide. Potter among the rock pools. If you’re lucky you might see seals. You’ll certainly find fossils. Go Fish Catch crabs with the kids at high tide along the beckside. Cast your rod out on the pier. You can even go out on a boat. Fishing and lobster-potting has been the mainstay of life in Staithes for many centuries and it’s easy to see why. SKIPTON By car: Staithes is on the A174 between Whitby and Saltburn / Redcar. By GPS, use postcode TS13 5BS to reach the village centre. Parking: Staithes was not designed for cars, so parking is on the cliff tops. You can drive into the village to drop-off bags and supplies; there is a 40-minute parking allowance on the main street. Eat, Drink and be Merry After all this activity and fresh air you’ll have worked up quite an appetite. You can eat cake on the sea front, enjoy a meal or snack on your way back POCKLINGTON to the car. Stay for dinner there are some fabulous bistros and pubs to choose from. Do your Own Thing We could go on forever, but we’re leaving this one for you. MARKET Staithes is a place whereWEIGHTON we can find time and space, let a little bit of light and air into our crowded busy lives. Do just what you want. Or don’t do anything at all. CLEVELAND CORNER High Street, Staithes, North Yorkshire TS13 5BH T:	01947 841 117 E:	info@clevelandcorner.co.uk W:	www.clevelandcorner.co.uk Sharon & Rob welcome you to their intimate cosy character bistro/B&B. Specialising in fish, sourcing local ingredients from the village. Constantly evolving seasonal menu. Exciting wine list & local organic beers. Endeavouring to fulfil any dietary requirements. Make a night of it by staying in an en-suite room. Passionate in providing an atmosphere that showcases the food they believe so strongly in. We hope you enjoy your visit in every way. As you walk down the steep hill from the car park overlooking the rooftops you will feel as if you’ve gone back in time. 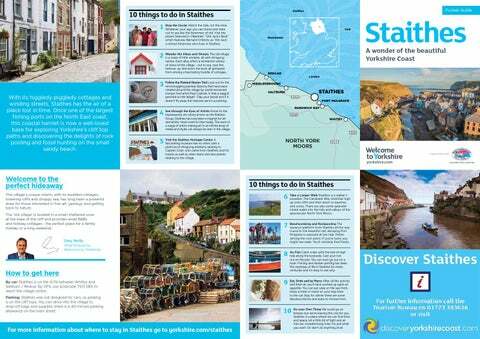 The soaring, rugged cliffs make Staithes a great place for walking and exploring. This is a wonderful place to discover and there are so many fossils that this area has been nicknamed the ‘Dinosaur Coast’ so keep your eyes open! STAITHES ACCOMMODATION 80 Staithes Lane, Staithes, North Yorkshire TS13 5AD T:	01947 840 888 E:	wjkilmartin@gmail.com W:	www.staithesaccommodation.com Trig Point 49 & Keel Lodges offer you a warm welcome to Staithes, a perfect destination for those who have never been and those who wish to return. Our family run 5 B&B rooms and 4 self-catering Lodges for 2 to 12, are all on ground floor and have free parking. We also have a wonderful camping area with panoramic sea views, all 5 minutes’ walk from harbour and beach. Our night sky and the almost total lack of light pollution means the skies come alight after the sun has set and our sitting out areas offer stargazing hotspots! Plenty of long and short interesting walks from the site including the Cleveland Way. Public transport links to Whitby run every half hour.Please look at our website to see what we have to offer. Our luxury en-suite accommodation offers a place to explore the picturesque old fishing village of Staithes, whilst being able to explore the plethora of attractions within the North York Moors National Park. At the Endeavour Restaurant we always try to take advantage of local and fresh seasonal produce and our menu changes to reflect the season. The 200-year-old Endeavour Guest House is in the heart of the picturesque North Yorkshire fishing village of Staithes. The tall building houses a dining room and four spacious en-suite double bedrooms. Leaving From The Harbour At 8pm If The Boards Out, The Ghosts are About! Adults £5 Under 12’s £3 Find Us On Facebook For Additional Dates & For Group / School Bookings. Staying in the old part of Staithes is a special experience as the village has a unique character and an atmosphere special to itself. Whitby Seafish Ltd, at the top of Staithes, just by the Car Park, offer Yorkshire’s finest, locally landed, fresh and smoked Seafood. Call in to see us for our award winning Oak Smoked Salmon for that indulgent treat, a Dressed Crab for lunch, and freshly smoked Kippers for your breakfast or some locally landed fish to have with your chips. We offer a selection of holiday cottages that sleep from 2 to 12, most allow pets, some with sea views and some with parking. All of our cottages are situated in the old village of Staithes. We also have limited car parking spaces in the old village (fee payable). All of our prime fish is sourced from the North East Coast, without exception, namely Whitby and Scarborough Fish Quays. As the boats are at sea for 3 days at the most, more often only 24 hours due to the weather! All our properties are no more than 100 metres from the safe little beach and the harbour, several cafes and a range of useful and interesting small shops on the way! PEELER’S REST 2 Staithes Lane, Staithes, Saltburn, Cleveland, North Yorkshire TS13 5AJ T:	01947 841 571 E:	lee.jacks@btopenworld.com W:	www.visit-staithes.co.uk Peeler’s Rest is a self-catering holiday let in Staithes and is attached to the village’s former police house. The property consists of 3 ground floor rooms, bedroom, lounge with kitchen area and bathroom. There is a double bed and fold out single bed. Sleeps 3. Free off street parking. All bedding and towels included. Everything you need for a relaxing break. Any length of stay – just ask. STAY IN STAITHES 107 Upgang Lane, Whitby, North Yorkshire YO21 3JD T:	07964 387 271 E: cottages@stayinstaithes.co.uk W:	www.stayinstaithes.co.uk Stay in Staithes is a direct marketing service for a select number of holiday cottages in Staithes. All our cottages are in this historic village and we offer a choice from cosy retreats for 2 through to larger houses suitable for families and groups of up to 8 people. We are flexible on your length of stay with short breaks available at most times of the year.